Smith did a gentle workout with the Tamworth squad before their Birmingham Senior Cup clash at Romulus on Monday night. 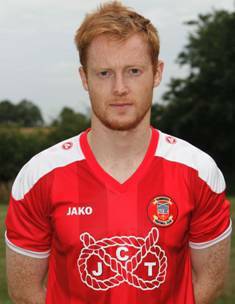 His return to the pitch comes just five weeks after suffering a horror injury against Gainsborough Trinity, which left him in intensive care at Lincoln County Hospital. His spleen was removed, leaving him on medication for the rest of his life. But Smith said he is now focusing on a playing return and could be back in action inside eight weeks. “I spoke to my doctor a couple of days ago and he gave me the green light to start doing low, intense exercise,” Smith said. “I have been really chomping at the bit and waiting for this day. “I am just over the moon to be back, putting my boots and kit on, the simple things, and heading onto the pitch. “It has just put a smile on my face and I am absolutely buzzing. “It’s good to get back among the boys. I will join them for training tonight as well and build things up slowly and steadily. “Having spoken to the doctor, he reckons that, in around about eight weeks, give or take, I should possibly be back playing. “That news came to me as a shock, as, although I feel good in myself and capable of doing a bit, I was expecting it to be longer. So this great news for me.